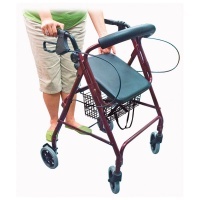 Check out our range of mobility aids. Adjustable seat height: 18-in. to 22-in. Only Available for a Limited Time! October is Breast Cancer Awareness Month. Show your support of the American Cancer Society (ACS) Making Strides Against Breast Cancer campaign! 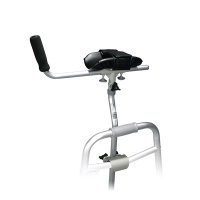 With this Adjustable Height Rollator from Drive Medical you'll be able to navigate safely and securely indoors and outside. Along the way, its vibrant pink color will act as a reminder to you and others of the fight against breast cancer. Plus, proceeds from purchases of this item go to the Making Strides campaign. 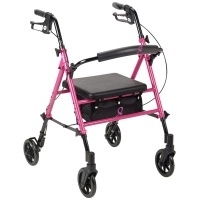 The ACS Aluminum Rollator features 6-inch casters, a fold-up and removable back support, universal seat height, padded seat and loop locks. - Handle Height: 29.5 in. - 38 in. - Seat Dimensions: 12 in. (D) x 13 in. (W) x 18 in. 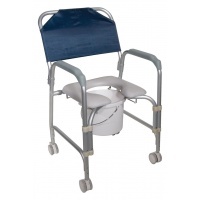 Chrome-plated steel tubing frame, includes a drop arm, designed for easy movement. 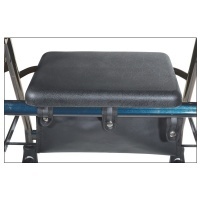 Swing-away footrests are detachable! Includes high-quality, stylish padded seats. Special lever lock prevents fingers from snapback contact when releasing the brake. 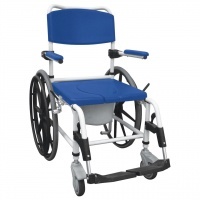 Manufactured with wrap-around welds providing additional strength and support. Easy folding for transportation. Limited lifetime warranty. Seat height: 23. Item weight: 14 lbs. Weight limit: 300 lbs. Color: Blue. 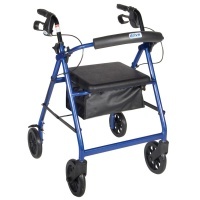 This aluminum rollator offers lightweight portability and convenience. Four wheel, loop brake style. Locking loop brakes. Convenient under seat zippered pouch. Adjustable handle height: 35-39. Padded seat and backrest. 8 soft-grip wheels for indoor/outdoor use. Special lever lock that prevents a person's fingers from snapback contact when releasing the brake. 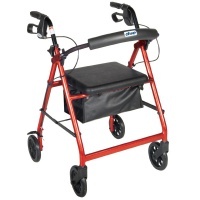 Manufactured with wrap-around welds providing additional strength and support. Easy folding for transportation. Limited lifetime warranty. Seat height: 23. Item weight: 14 lbs. Weight limit: 300 lbs. Color: Blue. 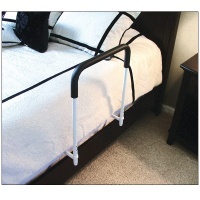 This Board and Rail provides assistance for getting in and out of either side of the bed. 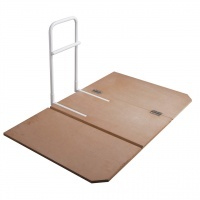 Tri fold wood board for easy portability and storage. Easy, quick, no tool assembly. Comes in 2 pieces. Simply slides under the mattress for extra firm support. 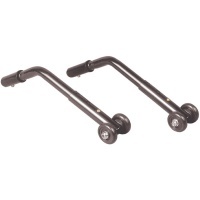 Removable powder coated steel handle enables user to remove when not in use. 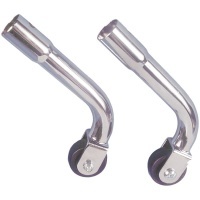 Handle with the Mid Bar, creates easy grip for any height use. Weight limit: 250 lbs.